We’d love your help. Let us know what’s wrong with this preview of She Stoops to Conquer by Oliver Goldsmith. To ask other readers questions about She Stoops to Conquer, please sign up. What is the language in she stoops to conquer? أعـتـرف أنّ أكـثـر الأشـيـاء بـهـجـة -بـالـنـسـبـة لي- بـعـد مـتـعـة مـطـالـعـة الـكـتـب، هـي مـشـاهـدة فـيـلـم سـيـنـمـائي أو تـجـسـيـد مـسـرحي لـ روايـة أنـهـيـت قـراءتـهـا. مـؤخـرًا كـان الـرّب كـريـمًـا مـعي، إذ هـيّـأ لي مـقـعـدًا أمـامـيًـا في إحـدى دور الـعـرض، شـاهـدت فـيـهـا تـمـثـيـلا رائـعـًا لـلـقـصّـة الإنـجـلـيـزيّـة "تـمسكـنـتْ حـتى تـمـكّـنـت". الـنّـص خـفـيـف، مُـضـحـك، زاده الـعـرض الـمـسـرحي طـرافـة. What is it with romantic comedies? I grab a book from a second hand bookshop containing some comedies from times past, and of the fours, plays three of them are romantic comedies. Okay, the other compilation of comedies that I had was a little better, but with regards to this collection I’m sort of a little disappointed that the only comedy that I can appreciate (namely isn’t some comedy of errors surrounding mistaken identities between lovers) is a play by Ben Jonson. Well, maybe we have Shakespeare to thank since pretty much all of his comedies generally fall into that category (and some of them are pretty sickening when I think about it). You’ve probably guessed by now that I’m not one for romantic comedies. I’d have to say that I’m more of a Lock, Stock, and Two Smoking Barrels type of guy than, say, Pretty Woman or some such. Okay, there are some romantic comedies out there that I have liked, such as Eternal Sunshine of the Spotless Mind, but then I really didn’t particularly find that funny, which is another thing: why is it that when you have a film that is basically a romance you have to throw the word comedy next to it even though there isn’t actually one funny line in the entire script? So, that brings us to the story of She Stoops to Conquer. Okay, sure, it’s a romantic comedy, but at least it is clever in its construction and simply doesn’t fall into the category of boy meets girl, boy looses girl, and boy gets girl back and everybody dances off and gets married and sing happy songs while Malvolio ends up rotting in a pit somewhere. Okay, everything does end up working out well in the end, but I’d hardly call it a spoiler since we pretty much are expecting that the moment we sit in our seats with a bottle of craft beer and the curtain rises for the act, with one exception – this play actually isn’t performed all that much, or at least where I tend to drift about. Then again, I suspect that maybe I wouldn’t be rushing out to actually see this play in a hurry, namely because it is a romantic comedy and they really don’t do all that much for me. Well, let us consider this one though – our hero has this problem in that he simply is not able to communicate with high class girls, so he ends up going after lower class women such as maids. However, there is a young lady that is interested in him, so to grab his attention she pretends to be a maid, only to discover that the world of the lower classes is pretty horrifying to a woman from a high-born social group. This I can easily understand, particularly when it comes to me intermingling with Christians (and I’m not talking about those over zealous, fundamentalist Christians either, I’m talking about average middle class people who happen to be Christian). The thing is that like it or not our world is divided into various social classes, and while we might pretend that we live in this so called classless society, in reality we don’t. For instance bankers and bricklayers simply do not mix, nor do fashion designers and engineers – while they may not necessarily be of a different class in the sense of aristocratic or working class, they still exist in a class of their own, which brings me to the point with regards to Christians – most of them are university educated middle class people. Okay, I’m technically middle class, and I’m also university educated, but I come from a vastly different background to what many of them have come from. In fact I remember when I was in university most of them simply hung around in their own little clique, and rarely stepped outside of it to actually see what was going on. I didn’t stay within the clique – I ended up walking out of it into a completely different social group, and saw and did things that would make people’s head spin (unless of course you were in a similar group). Yet, when I wandered back I discovered something quite surprising – they were economically and politically conservative, and I was completely the opposite. In fact most of the people in the finance industry are economically conservative, which is probably why I don’t really mix all that well. Recommends it for: People afraid of heavy reading, but in need of some good old fashioned humour. This play is really unique because even though it uses 18th century language, it's pretty easy to understand, and really funny! I didn't think I'd actually laugh out loud, but I did! Some parts needed reading twice to understand, but that was fine. A very enjoyable read! I still think that this play needs to be seen to fully appreciate it but I liked this audiobook recording of a live performance. It was easier to listen to this time (I have had more practice!) and thus I found it even funnier than when I heard it a few years ago. 4.5 stars. This full cast audiobook was a fun way to revisit one of my favorite Restoration comedies. However, I did find that some of the humor was a bit harder to visualize listening rather than r I still think that this play needs to be seen to fully appreciate it but I liked this audiobook recording of a live performance. It was easier to listen to this time (I have had more practice!) and thus I found it even funnier than when I heard it a few years ago. Re-reading for a bit of fun - still amusing! Considering this was written in the late 1700s, it feels remarkably fresh and very accessible, and some of the jokes are even funny by today's standards, which is an impressive thing for Goldsmith to have pulled off! It's classic Restoration fare - bawdy humour, plenty of misunderstanding and miscommunication, and a happy resolution at the end. The characters are particularly 'larger-than-life' which helps keep the attention; think typically Shakespeare Re-reading for a bit of fun - still amusing! It's classic Restoration fare - bawdy humour, plenty of misunderstanding and miscommunication, and a happy resolution at the end. The characters are particularly 'larger-than-life' which helps keep the attention; think typically Shakespearean-based plot-line, only a bit less wordy! Surprisingly funny and readable for something written in the 1700s! It relies on larger than life characters and ridiculous misunderstandings all carried off with zeal and bawdy humor. I want to see it performed! As subtle as a thunderclap and as realistic as wax lips, this is still mighty witty 245 years after its first production. I am looking forward to seeing it on the stage. This was a funny play about mistaken identities which I picked up because of the title. 'Stoops to conquer' is a phrase that was made popular by Aphra Behn in the mid 17th century in her play The Rover, referring to a person of the upper class pretending to be a maid/servant in order to gain the affections of their intended. The introduction notes that this text is part of a debate between comedians on the nature and purpose of the thalian arts. The classical theory, “which Ben Jonson had handed on to the Restoration playwrights,” contended that “the purpose of comedy was to expose, by hardheaded, satirical ridicule, the follies and vices” (vii) of fictional persons so as to correct those defects in the Real. We might think of it as a Hegelian theory of comedy, defined by the confrontation of Right with Wrong (as op The introduction notes that this text is part of a debate between comedians on the nature and purpose of the thalian arts. The classical theory, “which Ben Jonson had handed on to the Restoration playwrights,” contended that “the purpose of comedy was to expose, by hardheaded, satirical ridicule, the follies and vices” (vii) of fictional persons so as to correct those defects in the Real. We might think of it as a Hegelian theory of comedy, defined by the confrontation of Right with Wrong (as opposed to tragedy, the confrontation of Right with Right)—does Malvolio, for instance, have any plausible Right (as opposed to Goneril)? Goldsmith by contrast thinks that “folly, instead of being ridiculed, is commended” (ix), a sentimental representation that teaches audiences to pardon and sympathize. This debate is taken up in the text. The Prologue promises that those who deal in “sentimentals” will succeed (xvi), and the aesthetic polemic continues with lines such as “I have often been surprised how a man of sentiment could ever admire those light airy pleasures where nothing reaches the heart” and “There must be some who, wanting a relish for refined pleasures, pretend to despise what they are incapable of tasting” (25). Some equivocation perhaps on whether it possible to be “too grave and sentimental” (39). Plenty of wit and mistaken identity and whatnot otherwise to go around. As the title suggests, there is a class conflict here. The title refers specifically to (view spoiler)[ one character’s being “obliged to stoop to dissimulation to avoid oppression” (68) (hide spoiler)]. Whereas a “reserved lover, it is said, always makes a suspicious husband,” it is difficult when “I’m disposing of a husband, before I have secured the lover” (5)—but one also can be ‘threatened with a lover” (6), NB. Some dialectic between impudence and modesty: “An impudent fellow may counterfeit modesty, but I’ll be hanged if a modest man can ever counterfeit impudence” (15) and thereafter. This is tied into a repeated refrain about the rights arising from the oikos: “a man in his own house” being unrestrained (19 e.g.). This is all ultimately confounded (a repeated term in the text) in a character’s “modest impudence” (58) on the one hand and another’s “mild, modest, sentimental man of gravity” (67) on the other. It’s rare that I get to review a play after both reading and seeing it in a short period of time (although I've now had the chance to do that twice within a month). Admittedly, I’m predisposed to like She Stoops to Conquer. I like Oliver Goldsmith and consider The Vicar of Wakefield tremendously underrated. I held off reading She Stoops to Conquer simply because Mr. Goldsmith doesn’t have an extensive bibliography, and I want to savor his works. She Stoops to Conquer was worth the wait as both a p It’s rare that I get to review a play after both reading and seeing it in a short period of time (although I've now had the chance to do that twice within a month). She Stoops to Conquer was worth the wait as both a piece of literature and a play. It’s an innocent comedy of manners, full of mistaken identities, crossed signals, and ridiculous misdirections. I enjoyed reading it, but, given all of the physical comedy, seeing it performed raised it to another level. I listened to an audio performance of this play, knowing very little about it or the author going in. It was a pleasant surprise. She Stoops to Conquer has aged well, and, I feel, should be studied alongside Austen. The play predates Austen by about 30 years, but it fills in a lot of the gaps in Austen's work. She rarely acknowledges servants or employees of any kind, while this play highlights, if not the people themselves, how the gentry treated them. Marlow is a painfully shy young man, off to I listened to an audio performance of this play, knowing very little about it or the author going in. It was a pleasant surprise. She Stoops to Conquer has aged well, and, I feel, should be studied alongside Austen. Marlow is a painfully shy young man, off to meet Kate Hardcastle, the girl his father hopes he'll marry. He's accompanied by his friend Hastings, who's in love with Constance Neville, a ward of the Hardcastle family. On their way to the house, Marlow and Hastings get lost, and Tony, the stepson of Mr. Hardcastle, tells them the house is really an inn. Marlow is much more comfortable talking to servants and barmaids, but his behavior is baffling to Mr. Hardcastle. It allows Kate to see another side of her suitor, though, and she keeps up the pretense to draw him out. Marlow's behavior toward the Hardcastle family is truly appalling, but all is forgiven when the mistake is uncovered. It goes to show how differently servants were treated in so-called polite society. Anyone who wants to resurrect the Napoleonic attitudes needs to realize the vast majority of us are people who work for a living, and are therefore subject to being treated like we're subhuman. The scandals in Austen's work where people fall in love with those below their station is much more easily understood, in this context. Marlow, who's considered the very model of a gentleman, tries to proposition Kate as a prostitute, and is confused to be rebuffed. Her distance and objections are seen as flirtation, and he assumes she can't possibly mean "no" when she says it. It simply doesn't occur to him that a simple barmaid wouldn't want to sleep around. L.A. Theatre Works, who recorded this production, includes the sounds of an audience. Though the audience often found remarks uproarious, I found very little to laugh about in this play. It's sharply satirical, and a comedy in the classical sense, in that nobody dies and there's a happily ever after. But, I found the play more eye-opening than funny. Maybe if I were more familiar with the context, as audiences of the time would've been, I would've laughed more. I went into this book with very little expectation. I mean, it's a supposed classic that I've never heard of, and drama isn't my particular favorite. However, it was a free audiobook download from Sync this summer, and it was the recording of a theater production that included James Marsters (eek!). It's also only a couple of hours long (not a huge commitment at all), so I decided to give it a go. Um, why haven't I heard of this play before? Because it's hilarious! 20 minutes in, I was laughing n I went into this book with very little expectation. I mean, it's a supposed classic that I've never heard of, and drama isn't my particular favorite. However, it was a free audiobook download from Sync this summer, and it was the recording of a theater production that included James Marsters (eek!). It's also only a couple of hours long (not a huge commitment at all), so I decided to give it a go. Um, why haven't I heard of this play before? Because it's hilarious! 20 minutes in, I was laughing non-stop and having a thoroughly good time. The fact that this is recorded theatre gives it a huge advantage, since the performers give their lines with perfect emphasis and tone. She Stoops to Conquer is a typical comedy that centers around mistaken identities and misunderstood situations. All of the characters are funny and loveable, and the talent of the performers is unmistakable, even without being able to see them act it out. I'm so glad that I had the chance to discover this play, and that I was able to do so in an audio format. I think that most plays are meant to be heard and/or seen, and I would definitely recommend staying away from the print and going straight to a performance or this audio version for She Stoops to Conquer. Many of the jokes wouldn't be very funny without hearing the interaction between the characters and without hearing the inflections of the words. The plot is fairly predictable; however, because of its simplicity and some of the extremely ludicrous characters (like Mrs. Hardcastle), I believe this was written as a parody of the mistaken identities type of play that Shakespeare is so famous for. If you ever get the chance to listen to this, or see it performed, do so! It's one of the funniest plays I've come across. MISS HARDCASTLE: I never knew half his merits till now. He shall not go, if I have power or art to detain him. I'll still preserve the character in which I stooped to conquer, but will undeceive my papa, who, perhaps, may laugh him out of his resolution. I have to be honest: I have been meaning to read She Stoops to Conquer for quite a long time, but just never got around to it until recently. Plays are in high favor for me because of their tendency to be easy to read in one long sitting, MISS HARDCASTLE: I never knew half his merits till now. He shall not go, if I have power or art to detain him. I'll still preserve the character in which I stooped to conquer, but will undeceive my papa, who, perhaps, may laugh him out of his resolution. 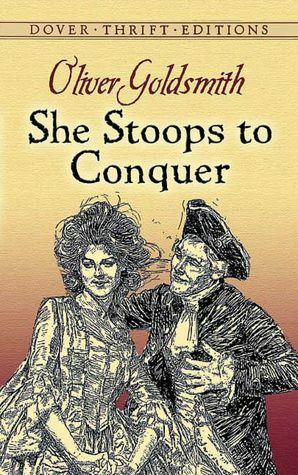 I have to be honest: I have been meaning to read She Stoops to Conquer for quite a long time, but just never got around to it until recently. Plays are in high favor for me because of their tendency to be easy to read in one long sitting, unless the play is bad and it feels as if it drags on for ever and ever. Good thing this play was exactly the opposite. Stoops is a wonderful comedy of manners that feels clever, is written wittily by a fantastic playwright, and is probably a whole lot of fun for actors as well. I can only imagine that seeing this play would be quite a riot; I plan on seeing it when I get the chance. The basic premise is that a man is set to be engaged to a woman of high class, but he has a weird anxiety around high class women that renders him almost speechless and extremely awkward. However, he takes a special liking to lower class girls such as maids. Additionally, the step brother of the young lady is quite the trickster who figures out this oddity and causes the identity confusion that really carries the play through. choose between putting your fiance in a challenege and test to see whether or not they do believe in true love of feelings and not that of emotions and find out for yourself whether or not they deserve your true love and decency or not. is it true that a woman could win the heart of any man she wishes in such as stooping to conquer method?and what about what seems to be a saloon marriage which ends up in a modernly fashionable way of getting around fate to win more love and respect for wittiness choose between putting your fiance in a challenege and test to see whether or not they do believe in true love of feelings and not that of emotions and find out for yourself whether or not they deserve your true love and decency or not. is it true that a woman could win the heart of any man she wishes in such as stooping to conquer method?and what about what seems to be a saloon marriage which ends up in a modernly fashionable way of getting around fate to win more love and respect for wittiness of ethics and smartness rather than be beautiful and use it to be a 'bar tender's ethics'?is it worth stooping to conquer?read the prologue first in her defence and the epilogue and then decide for yourself. A very fun, very innocent comedy compared to others of the time in which there was a bit darker elements. Sort of more like a Shakespearean comedy of errors, as a prank leads to a series of misundertandings and some fooling around leads to much more trickery. Oliver Goldsmith's 18th-century hit comedy of errors remains readable today, because it's timeless and funny. By timeless, I mean that its humor is far more reliant on dramatic irony than recognition of inapropos references to pop culture -- although this edition does an excellent job of annotating the few that appear -- to allow for skillful substitution to more contemporary settings. A brief example of what I mean, from Act II (ostensibly scene 4, though the action has continued unabated in the Oliver Goldsmith's 18th-century hit comedy of errors remains readable today, because it's timeless and funny. By timeless, I mean that its humor is far more reliant on dramatic irony than recognition of inapropos references to pop culture -- although this edition does an excellent job of annotating the few that appear -- to allow for skillful substitution to more contemporary settings. HASTINGS: ...You amaze me! From your air and manner, I concluded you had been bred all your life either at Ranelagh, St. James's, or Tower Wharf. MRS. HARDCASTLE: O! sir, you're only pleased to say so. We country persons can have no manner at all. I'm in love with the town, and that serves to raise me above some of our neighbouring rustics; but who can have a manner, that has never seen the Pantheon, the Grotto Gardens, the Borough, and such places where the nobility chiefly resort? All I can do is to enjoy London at second-hand. I take care to know every tete-a-tete from the Scandalous Magazine, and have all the fashions, as they come out, in a letter from the two Miss Rickets of Crooked Lane. Pray how do you like this head, Mr. Hastings? HASTINGS: Extremely elegant and dégagée, upon my word, madam. Your friseur is a Frenchman, I suppose? MRS. HARDCASTLE. I protest, I dressed it myself from a print in the Ladies' Memorandum-book for the last year. (view spoiler)[ Hastings is teasing, testing to see if Mrs. Hardcastle is sufficiently worldly to recognize a notorious red-light district pinned to the end of his list of London's architectural wonders. Hardcastle's turn now, only in her instance she mistakes a strip mall for one of London's tourist attractions. Here substitute "US magazine," or, for a real gasser, "Weekly World News" or "Teen Beat"
 Generic comic name for gossips on a typical rural byway: "from X and Y on RFD#6." This is another rube joke, but not necessarily one of Hastings', who is attempting flattery. For this to land, Hardcastle must pause significantly before her line until she makes up her mind to fake comprehension. Despite this example, reference-laced or wit-based humor is rare in this play; the majority of the levity derives from the characterization (the fussy, dowager-fool, for example, as played off against straights or her wicked clown of a son) and the plot. This latter takes a while to set up, but the basic premise has two suitors traveling to the home of a country gentleman to woo his daughter and niece-ward, respectively, arriving under the misapprehension that the host (whom they haven't met) is but an upstart innkeeper. The rake slated for the daughter mistakes her for a barmaid, a good thing, considering that he would otherwise be psychologically incapable of conversation with her. The other couple face different, and more serious complications, but those are mere subplot. Can romance bloom despite the deception? Can it be sustained ere the error is o'erthrown? Such is the stuff that sustains interest in the work. If you've never read or seen a comedy of errors or farcical play like those of William Shakespeare and Oscar Wilde, then you might find this more entertaining than I did. Having studied Wilde's slightly more modern The Importance of Being Earnest in great detail as a teenager and later watching An Ideal Husband, you come to realise this genre is little more than a one-trick pony; if you've seen one, you've seen them all. Besides minimal alterations in events, only the cast and the production v If you've never read or seen a comedy of errors or farcical play like those of William Shakespeare and Oscar Wilde, then you might find this more entertaining than I did. Having studied Wilde's slightly more modern The Importance of Being Earnest in great detail as a teenager and later watching An Ideal Husband, you come to realise this genre is little more than a one-trick pony; if you've seen one, you've seen them all. Besides minimal alterations in events, only the cast and the production values change from play to play, from performance to performance. Originality is harder to come by in these older and somewhat old fashioned, and perhaps less sophisticated, plays. Wilde managed to stand out from the crowd with his tricky witticisms and absurdities. She Stoops to Conquers possesses nothing so unique, as far as I can tell. The repetitive nature of this sort of play's light humour devices such as the use of puns, wordplay, slapstick and the heavily relied upon mistaken identity trope (which is used here), concluding with the inevitable romantic happy ever after enacted by genteel, upper class main characters making satirical references to gender and class politics before falling in love at the drop of a hat (sometimes literally), tend to leave me a little bored of the predictability while only evoking a chuckle or two at most. Also repetitive was the use of the word 'impudent'. Unfortunately this was written pre-thesaurus so I'll have to forgive Goldsmith's overuse since he didn't have easy access to synonyms like we do today. Not very challenging, but amusement is necessary. In fact, Barbara Fredrikson, an authority on positivity – has included amusement among the ten elements of positivity. The other nine are Interest, gratitude, pride, joy, serenity, inspiration, awe, hope and love. Mr. Hardcastle is a rich man who wants to see his daughter married. This story takes place more than two hundred years ago, when girls had to marry early, or else they were at risk of not finding a proper husband. Charles Marlow is supposed to come from London to meet Kate, the daughter in question, but he is shy. In fact, the fact that he is rather outspoken in milieus where he can talk will cause a good deal of trouble. He reminds me of Rajesh Kouthrapali, from The Big Bang series, who can’t even talk to women without alcohol, but when he drinks he runs amuck. Kate has a half-brother –Tony Lumpkin, who likes to drink and to play games with other people, laughing at them. -	Do you know where I find the Hardcastle mansion? I did not copy this, but just wrote the basic idea. Upset that he is thought a bit of a fool, Tony makes a practical joke and sends the guests to the Hardcastle residence. -	What do you have in the menu? -	The beds are clean? And many more words to this effect. The audience is entertained by the complications generated by this confusion, where the guests pretend services and demand them imperatively. Since they think they will pay for whatever they get, they allow themselves liberties that we would not dare and take when we are invited guests. Charles does go over the top and that left me a bit of a bad feeling, but otherwise it is a fun play and there are some good moments. A surprisingly funny and readable play with the classic Shakespeare-style mistaken identity twists but without the heavy wordplay. I quite liked it, to my surprise, even though I embarked upon reading it mostly as a sort of compare/contrast with Shakespeare thing. Goldsmith and Shakespeare weren't contemporaries, the former being born a hundred years after the latter's death, but it seems the plot of comedic plays hadn't evolved too much in the interim. Rhyming prologue, five acts, one romance, A surprisingly funny and readable play with the classic Shakespeare-style mistaken identity twists but without the heavy wordplay. I quite liked it, to my surprise, even though I embarked upon reading it mostly as a sort of compare/contrast with Shakespeare thing. Goldsmith and Shakespeare weren't contemporaries, the former being born a hundred years after the latter's death, but it seems the plot of comedic plays hadn't evolved too much in the interim. Rhyming prologue, five acts, one romance, one sub-romance, goofy parents, ends in double weddings, etc. The play involves class more directly than Shakespeare in a sort of Jane-Austen-y eighteenth century way, but other than that the plot is quite similar to the lighter Shakespearean comedies. Perhaps the difference in time period shows most in the language, which seemed so readable it almost felt like cheating. Most of the puns were understandable! Not sure if it's the century, or an author who just wasn't as devoted to putting fifteen levels of meaning into every bloody word. The dialogue was positively understandable! The main male love interest mumbles idiotically in the presence of nice ladies, and his stammery half-sentences made me feel right at home. The whole thing is a couple hours read at most and that was quite refreshing really. Which is not to say that I didn't at times miss Shakespeare's incredible wordplay, or his deep devotion to iambic pentameter. A good Shakespeare monologue is like watching a perfectly executed Olympic dive, and Goldsmith has the good sense to avoid anything so ambitious and stay on the shallow end of the linguistic swimming pool, contenting himself with quips and zingers and some decent banter here and there. It is easier to notice the incredibly contrived and predictable plot when you don't hang puns all over every thing, but honestly it's all in good fun and I enjoyed it immensely. It has been a while since I've sat down and read through a play but I do enjoy reading through plays so I was quite interested in reading She Stoops to Conquer. The story line of She Stoops to Conquer was quite an interesting story. It’s typical of a romantic comedy although in reading about this play after, I discovered that there is a large debate over which type of comedy this play contains. I was lucky enough to listen to this through audio but I found an ebook version online to read through a It has been a while since I've sat down and read through a play but I do enjoy reading through plays so I was quite interested in reading She Stoops to Conquer. I was lucky enough to listen to this through audio but I found an ebook version online to read through as well. I found the audio was good because as this is a play it’s meant to be performed and so I got a feel for how the characters act and such. I enjoyed the writing style and the language used, which given this book was written in the 1700’s is something to be admired. I always enjoy older prose as it has a more sophisticated feel to it. A comedy of manners taking place at an English country house, which several of the "guests" have been led to believe is an inn. One of these young men was supposed to go there anyway to meet the landowner's marriageable daughter. His friend wasn't supposed to go there because he was supposed to stay away from the marriageable niece, whose aunt had other plans for her (to marry the aunt's son and thus keep the "jewels" in the family - I'd like to hear Freud's interpretation of that!). Apparently A comedy of manners taking place at an English country house, which several of the "guests" have been led to believe is an inn. One of these young men was supposed to go there anyway to meet the landowner's marriageable daughter. His friend wasn't supposed to go there because he was supposed to stay away from the marriageable niece, whose aunt had other plans for her (to marry the aunt's son and thus keep the "jewels" in the family - I'd like to hear Freud's interpretation of that!). One of the comic jewels of the English theatre, She Stoops to Conquer lampoons the quirks and customs of 18th-century England, from matchmaking and marriage to character and class. Aptly subtitled The Mistakes of a Night, this light-hearted farce turns several imminent romances upside-down through an absurd series of deceptions, disguises, and mistaken identities. It’s a wildly funny romp through the English countryside. Come see it live onstage at the American Shakespeare Center's Blackfriars Pl One of the comic jewels of the English theatre, She Stoops to Conquer lampoons the quirks and customs of 18th-century England, from matchmaking and marriage to character and class. Aptly subtitled The Mistakes of a Night, this light-hearted farce turns several imminent romances upside-down through an absurd series of deceptions, disguises, and mistaken identities. It’s a wildly funny romp through the English countryside. Come see it live onstage at the American Shakespeare Center's Blackfriars Playhouse in Staunton, VA.
A short play about courting. Tony Lumpkin doesn't want to marry his cousin, Miss Neville, even though his mother highly encourages the act. His sister (step-sister really) is about to meet the husband picked out for her by her father. Neither lady is very excited about the match. Apparently Miss Hardcastle (his sister) has been told that her husband is "bashful," a thing she cannot abide. And for her part, Miss Neville has a suitor that she is much more interested in. Both of the suitors are head A short play about courting. Tony Lumpkin doesn't want to marry his cousin, Miss Neville, even though his mother highly encourages the act. His sister (step-sister really) is about to meet the husband picked out for her by her father. Neither lady is very excited about the match. Apparently Miss Hardcastle (his sister) has been told that her husband is "bashful," a thing she cannot abide. And for her part, Miss Neville has a suitor that she is much more interested in. Both of the suitors are heading for the Hardcastle home when Tony plays a trick on them making them believe they are staying at an inn. Chaos ensues. Okay. If I was writing an encylopaedia (and why not? That sounds like a fascinating thing to do), this would be the definition of farce. It's fast, with entrances and exits, declarations of love, caskets of jewels, innuendos, and pithy wits flying back and forth as fast as the tennis balls at wimbledon. Oh, and in case that can't hold your attention, we've got plenty of mistaken identities thrown in too. It gallops along to a smashing conclusion that's as pat and fun and ridiculous as a falling Okay. If I was writing an encylopaedia (and why not? That sounds like a fascinating thing to do), this would be the definition of farce. It's fast, with entrances and exits, declarations of love, caskets of jewels, innuendos, and pithy wits flying back and forth as fast as the tennis balls at wimbledon. Oh, and in case that can't hold your attention, we've got plenty of mistaken identities thrown in too. It gallops along to a smashing conclusion that's as pat and fun and ridiculous as a falling anvil. I need to see this play. Or watch some cartoons. Silly, clever little play that I did not expect to like at all and became entranced by it. It is so simple yet there are numerous twists and turns...very delightful and highly amusing. I had never heard of it, yet after reading I had heard it mentioned several times since. I guess I was alone in my ignorance but I'm delighted to have discovered this little gem. Thoroughly delightful! Not one of the best plays ever, but certainly a fairly good one. It is also good to know where the quote "Ask me no questions and I'll tell you no tales" came from. Though in "She Stoops to Conquer" the quote was "Ask me no questions, I'll tell no fibs." I liked the ending. It is fairly comic - not the Egyptian comedy but nonetheless fairly funny. My grandfather gave me an old book of plays when I was a young teenager. This was one of my favorites. It's basically a romantic farce. It has held up pretty well since it was first performed in London in 1773. It is very accessible since I read it at probably 13 years old. So if you're at all interested in seeing what was being performed on stage between Shakespeare and Cats, give it a try. Don't be entirely seduced by the thigh-slapping period appeal of this magnificent play. At a deeper level Goldsmith is dealing with the eternal tension between sexual appetite and social personality. It is a truly fascinating exploration! The Anglo-Irish poet, dramatist, novelist, and essayist Oliver Goldsmith wrote, translated, or compiled more than 40 volumes. The works for which he is remembered are marked by good sense, moderation, balance, order, and intellectual honesty.